Even though Tampa's distinct climate presents a unique set of challenges when it comes to siding, you're certainly not limited in your options. Read more about the 8 siding solutions that we can offer you. You don't want to be stuck in the rainy season with a leaky or outdated roof. Whether you need a full roof replacement or you need a roof repaired, no job is too large or small. We're happy to help! Read more about your 7 roofing options if you're in the Tampa Bay area. Exterior doors and windows are our specialty. We not only can help you create a unique look, but we can also help you reduce your energy bills with green windows and doors. Read about the 19 types of doors we have experience with or see your 17 commercial and residential window options. Many of the calls we get are from general building contractors or owner builders who are doing their project without bank financing, which legally entitles them to sub-out their own work as their job progresses. Either way, new home construction projects call for tight scheduling, the ability to work with and schedule around other trades, so that the job flows smoothly and the project is finished right on schedule. So all work aside from being competitive in the bidding process must also begin when promised, completed on time and pass inspection without any snags. 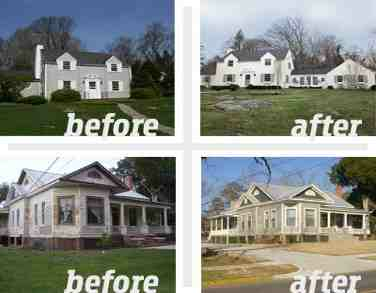 We know all too well that when it comes to residential remodeling and repairs each client is different. They’re different in terms of what work needs to be done on their home and also different in terms of scheduling, local community work restrictions and for sure different in terms of their personalities. One thing that they all have in common though, is that they expect that all workers who come up their driveway be decent, competent and trustworthy and this is why so many of the calls that come in to our office are from homeowners who were recommended to Tampa Exteriors by friends, relatives and coworkers. One major item that sets commercial building work apart from residential work is that in most cases there is some type of commercial activity that’s taking place were the work is going on. Customers and clients are coming and going that must be accounted for during the planning process and as the work unfolds. Once a contract is signed though, a commercial operator in many ways is at the mercy of the contractor who has his own business to run. So we make sure that all the needs and particulars surrounding a business are accounted for before the work begins on any commercial job.